meters from the ‘little beach’ of the old resort. Both friends had visited the spot with the intention having a drink, enjoying the landscape and listening to music around 3:30 a.m… All was normal, except for the wind becoming stronger at that time. 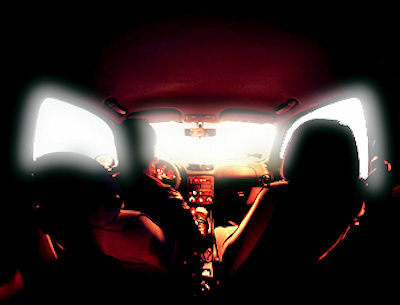 But something flooded the car in a powerful white light. Everything inside the car turned off, including both people’s cellphones. The car began to shake and move. “It was a moment I don’t care to relive ever. The car was parked but running due to the need for heat; the stereo was on, when suddenly that white light appeared right over my car. Everything lost power, even the cellphones. The car began to shake and a whistling sound could be heard, but not from the wind, it was due to something else. I don’t know, I can’t explain it properly. My friend couldn’t get out of the car due to her nervousness; I opened the door and began to get out, but I was unable to keep my balance and I had to hop, as did my friend. We ran toward the trees, and when we looked at the light it turned off. A loud whistling sound could be heard along with the noise made by the car, as though it [the light] was falling. But I couldn’t make out any shapes. The light was very bright, LED-type and gave off warmth. We waited under the trees for some 20 minutes and went back to the car, but it was dead – no battery. It took us around an hour to get it started by pushing. The cellphones were also dead,” added the man, who did not want to give his name or his friend’s name due to security concerns. 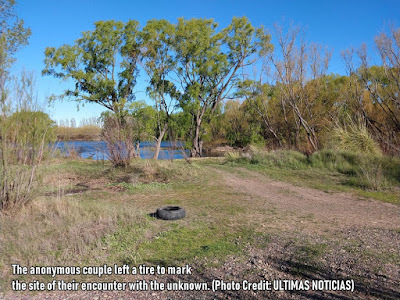 Ultimas Noticias visited the site described by the person by nothing unusual was detected aside from the vehicle’s tire marks, and the tire they left behind to mark the scene of the event. We asked people on the river if activity of this sort was frequent in the area and all remarked something similar. “A few years ago I was fishing with some friends and we saw a light that came out from behind the boardwalk. It rose high in the air and then descended, hanging over the river for a few seconds before disappearing,” explained a fisherman. “Here you’ll find many people who have seen the lights. Many talk about them and others keep their experiences to themselves, but it’s true that strange things are seen in this area,” stated a man who was fishing with his family.